Remember back when you were in school and March Break was a thing? Unless you’re a teacher or you have kids, that’s probably a distant and fading memory. How awesome would it be if everyone got March break, including adults? Despite March Break being a lovely 1-week holiday that not everyone gets to take advantage of, a couple of my friends and co-workers are taking off to hot sunny destinations this month. It’s round about this time of year that I think most folks are just plain sick and fed up with winter and everything that comes with it – the snow, ice, winter jackets, boots, salt stains, mittens, runny noses, dry hands, cracked lips, chipping ice off the windshield….. and all the rest of it. They go away with fingers crossed that upon return, the snow will have magically melted and spring will have sprung. Something’s telling me that’s not going to be the case this time around! In addition to wanting to ditch the winter layers and have spring arrive ASAP, my head is full of ALL THE THINGS right now. Work things, moving things, renting things, insurance things and packing things.. just to name a few. Adult life, as I’m realizing more and more each day, can be tough… and I don’t even have any kids that need to be taken care of! Of course, I’m not the only one dealing with major change. I’m sure some of you out there are going through similar situations – perhaps even more complicated than mine. Maybe your head also feels like if you tip it a little too far in one direction, everything’s going to come spilling out like a bunch of full glasses (green smoothies maybe?) crashing down off a serving tray. Maybe your stomach also feels like it’s doing backflips when you think about all the details that still need to be sorted out. You have to be prepared to give up the good in order to get the great. Change isn’t supposed to be comfortable – it’s meant to challenge us and make us stronger. And even though it’s a lot easier said than done, I think it’s in the midst of all the chaos and change that it’s most important to ensure we’re looking after ourselves in the best ways possible. With major life decisions, from moving across the country, career changes, to taking on any sort of new responsibility or commitment, there are only so many things we can control. 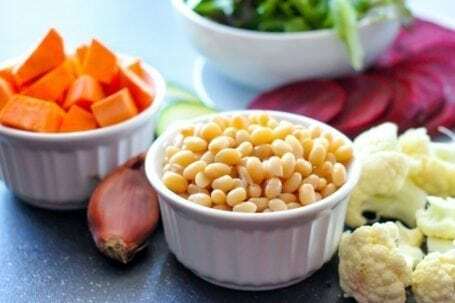 In my opinion, nourishing our bodies with nutritious food (which affects us in so many more ways than we consciously notice) is often one of those controllables. With a full brain and a to-do list longer than my arm, this Down to Earth Bowl was a creation that came out of my kitchen on the weekend. How did it get its name? Well firstly, all of the ingredients (except for the balsamic vinegar and seasoning I suppose) came out of the ground. But that’s not the only reason. 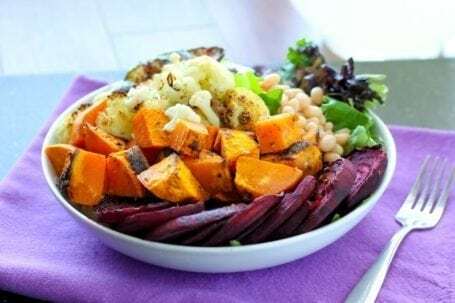 According to Ayurvedic medicine, root vegetables (including beets and sweet potatoes, 2 key veggies in today’s recipe) help us to feel more grounded, supported and stable. They support our root chakra, which is the chakra (or energy source) at the foundation of all the others and is linked to feelings of security, survival and trust. 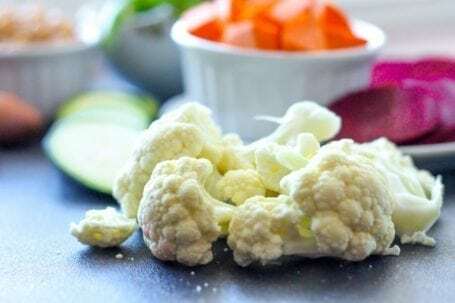 Whether or not you understand or subscribe to Ayurvedic principles, I’m willing to bet that eating a bunch of well-cooked root veggies will make you feel more stable and centered than, say, a bowl of raw greens, cucumbers and tomatoes. That’s not that there’s anything wrong with greens, cucumbers and tomatoes! But in this case, if calm and rooted is the sort of feeling you’re looking for, or if feeling flighty and scattered is a feeling you’re trying to overcome, I think you just might find comfort in this bowl. Preheat the oven on the high broil setting. 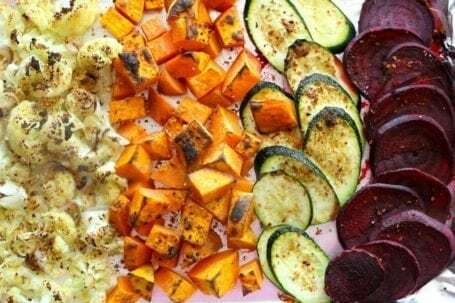 Chop the sweet potato and cauliflower, and slice the zucchini and beets. Lay them out as flat as possible on the baking sheet and mist with olive oil. Sprinkle with salt-free seasoning and roast/broil for 20 minutes, flipping half way. Line the bottom of a big bowl with greens. When the veggies are ready, take them out of the oven and arrange them on top, in addition to the beans. Whisk or shake up the balsamic vinegar and olive oil. Add a little sea salt and/or black pepper to taste, then drizzle it over the vegetables. 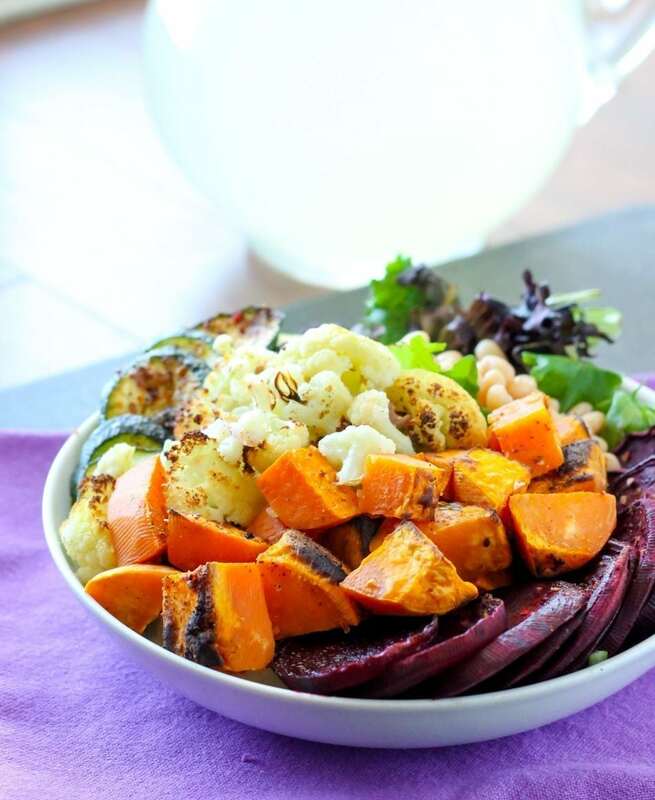 Have you ever noticed that root vegetables affect how you feel in the ways that Ayurvedic medicine proposes? What’s your body craving these days? Absolutely Madeline! I also like them because the possibilities are endless. Just like stir fries, they’re one of those great clean-out-the-fridge sort of meals! And I have said it before and I say it again – you are going to ROCK this move. Oh, this is great. 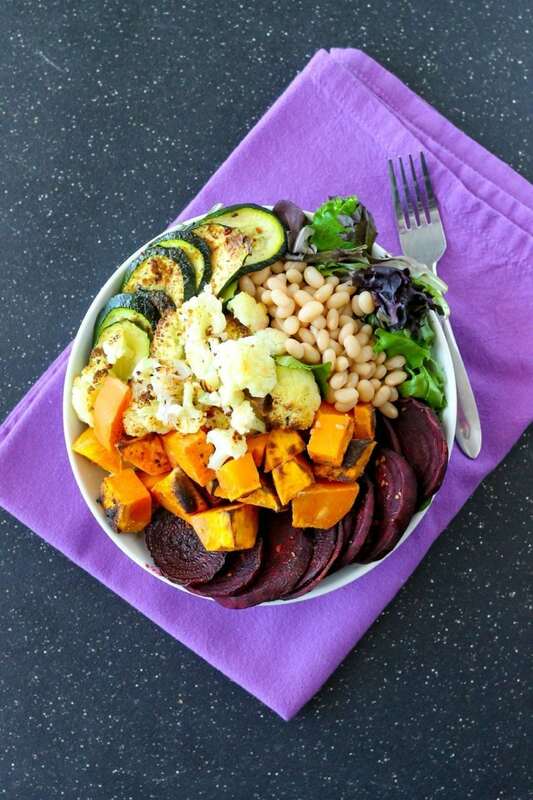 Lots of vegetables and legumes with a simple seasoning – perfect. 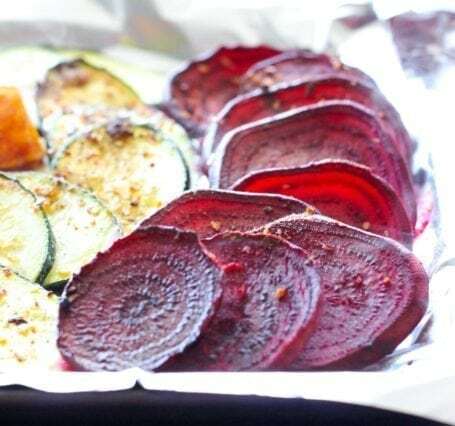 I don’t like beets [yet] but want to so this might be a dish to give them another try. 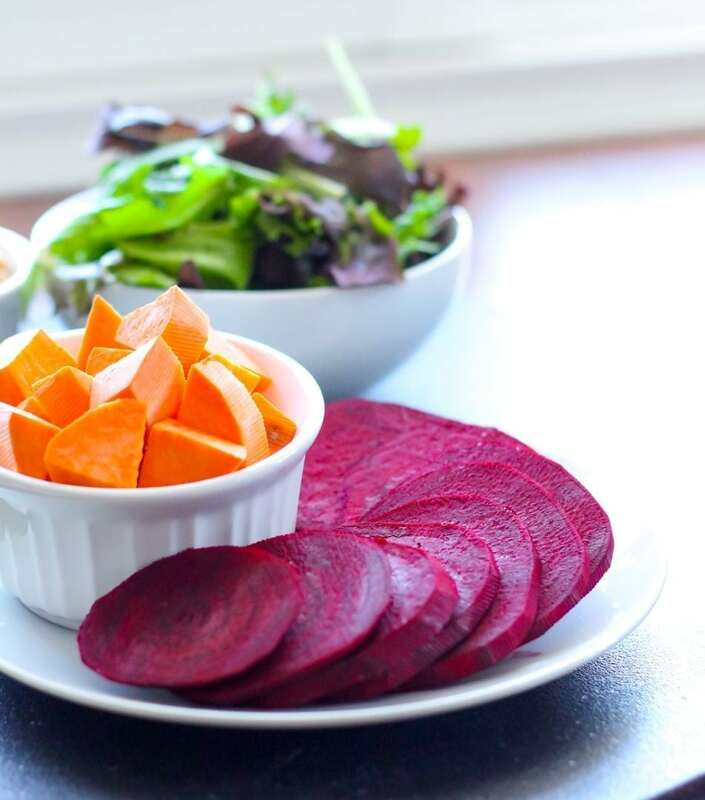 It took me a REALLY long time to learn to like beets, but now I absolutely adore them. They’re an acquired taste for sure! My dad used to pickle them and that was my main memory of what they tasted like (ie gross) but roasted are about 8402045782332 times better! Nice! We are eating similar bowl meals, eating the perishables before leaving for our own wedding down South. It will be a nice treat, for sure. 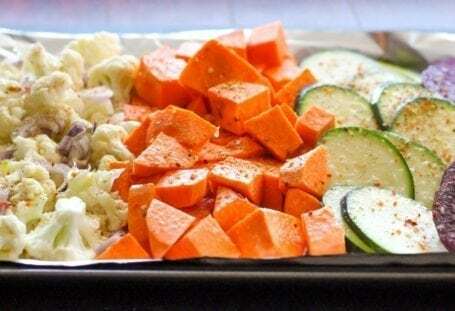 Do you think the veggies would hold up for a day or two in the fridge if I roasted them ahead of time? 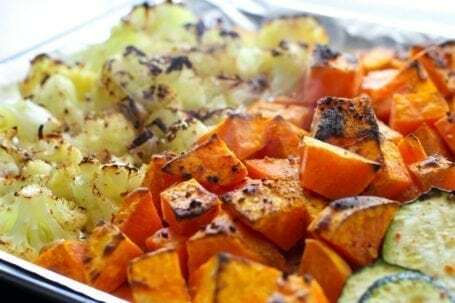 Or is it better if the veggies are hot out of the oven? Hi Cathy! The veggies will hold up ok in the fridge (call me weird, but I actually really like cold roasted veggies) – they might just get a wee bit soft. If you’re ok with that, then go for it. However, if you want them to be nice and crispy, I’d recommend straight from the oven.